Few things go better with a Las Vegas Pub Crawl than some good, quality Mexican food. One of the newest bars in Downtown Las Vegas is Nacho Daddy, a traditional American grill with a little bit of Mexican flair. If you plan ahead, you can make Nacho Daddy the first stop on your Las Vegas Pub Crawler tour to fill up your stomach for the night’s festivities. Nacho Daddy is the perfect place to hang out and relax in Downtown Las Vegas and grab a delicious meal while you’re at it. Don’t let the name fool you, while they do have the best selection of Nachos in town, they have much more to offer on the menu as well. In addition to Nacho Daddy’s 10 different variations of nachos, we also have a wide variety of Mexican classics like street tacos and enchiladas as well as a few unique, vegan options. With great food and a fantastic drink selection that includes their signature Scorpion Shot, it’s no wonder why Nacho Daddy has quickly risen to the top of the Downtown Las Vegas bar experience. Nacho Daddy in Downtown Las Vegas is a great place to sit and hang out with friends and with the NFL season fast approaching, a great place to watch the game. The best way to experience all the best bars Downtown is to schedule your own Vegas Pub Crawler tour. We’re the local experts on all the best and hottest bars Downtown and would love to show you and your friends a great time. 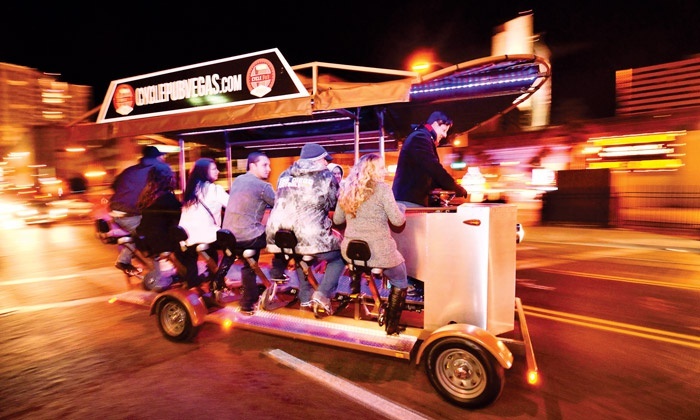 Book your very own Vegas Pub Crawler tour online today!